Researchers at ANSSI and CEA-Leti have published an interesting paper on Deep Learning in Side Channel Analysis, along with measurement data and trained models, called the ASCAD database. Scripts and instructions how to obtain the data are found in a repository on GitHub. Two simpler models that fit the ASCAD data quite well are provided below, with some scripts that allow comparison with the original ASCAD trained models. Download the ASCAD database as described in the README.md file in the ASCAD GitHub repository. Install Python3 and packages required to work with the ASCAD models, in particular: numpy, matplotlib, h5py, keras, tensorflow, etc. The script run_models.py performs, by default, 100 test runs with a test batch size of 70 on each model. These numbers can be modified by command-line arguments. 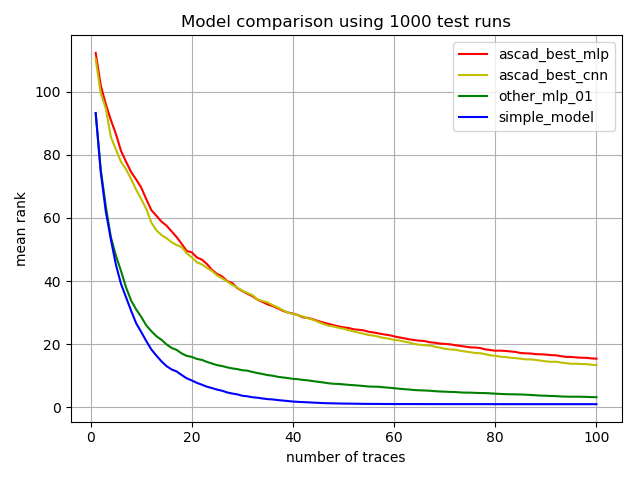 In each run, a batch of randomly selected test traces is used, and the current model is used to predict probabilities for S-Box outputs for all traces in the batch. The rank of the correct subkey is then tracked as the evidence from each trace is cumulatively added in along the batch. Finally, a plot is produced that shows the mean rank numbers obtained for each number of traces, averaged over all test runs (batches). Assembling a pile of numbers as in simple_model.bin is left as an exercise to the reader (it is less than 48 KByte), or you may use the script mk_simple_model.py supplied in the tarball to learn how it was done. A non-trainable batch normalization layer is used on the input, initialized with means and standard deviations of the training set. Without normalization, about half the neurons in the first layer would be "dead", i.e. they would have zero activation for all traces in the dataset. The normalization also allows the optimizer to work more efficiently. This may be why the model gets away with only 50 units per layer and with only 25 epochs of training, while still showing reasonable performance.